Natural toy parts. Untreated, safe and fabulous for toy making. CLICK ON EACH PICTURE AND USE YOUR CURSOR TO SCROLL FOR A BETTER VIEW. All natural and safe! Wood toy hanger for bird toys. Recommended for smaller bird toys for small birds, as this item is easily chewed by the "bigger beaks"
Approximately 2" in length and 3/16" thick. How awesone is this? A great foot toy for the big guy, or make it a toy base for a hanging toy! Stuff it inside of something for a fun surprise! Endless possibilities! Be sure to check out our seagreas mats and acrylic toy parts! 1/2 inch braided bear grass. Great for toy making or just hang it in the cage for added shredding! 45" in length. A wonderfully munchy toy component. Banana leaf wrapped around a circular configuration of dried grass strands. Measures 15 1/2 feet long! Great for making toys for the little guys. 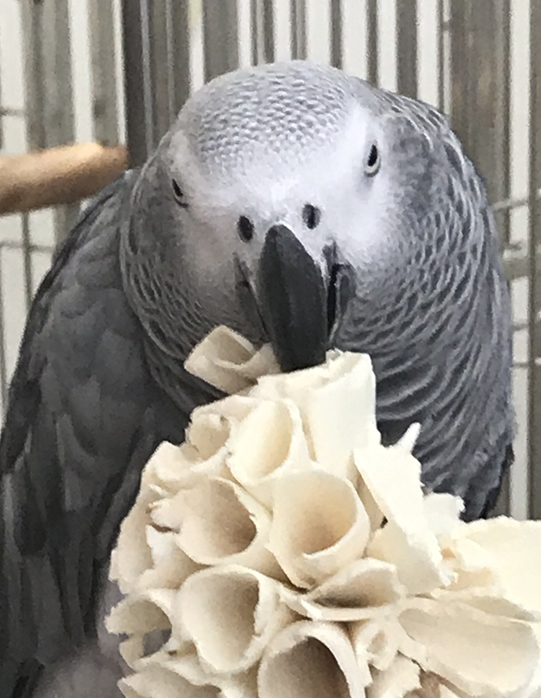 Bird safe and fun, since it is also great beak and talon enrichment. Width is approximately 3/16"
100% Natural. Approximately 4" long and 1/4"-1/5" in diameter. Use for toy making, foraging, foot toys... be creative! 100% Natural. Approximately 3" to 4" long and 1/4"-1/5" in diameter. Use for toy making, foraging, foot toys... be creative! Approximately 32-35 pieces per ounce. 2 inches in width, 1/8 inch thick and 32+ feet long. Tons of great uses for this one! Flat Virgin Cork Bark - sold by the pound. Slices vary in size since this is a natural item. No two pieces are alike. Approximately 5 pieces per 1/2 pound. Average size is 6x3 inches. Flat Virgin Cork Bark - sold by the half pound. Chunks vary in size, as they are a natural item. No two pieces are alike. Approximately 26 pieces per 1/2 pound. Average size is 2x2 inches. Natural fruit pod (also called a mahogany bean). Pods vary from approximately 3" to 4" in length and 1" to 1-1/2'' in diameter. These fun to chew toy pieces are pre-drilled with a 5/16" hole. Great strung from paper rope or poly rope. Layer with wood slats or wooden balls. These do not contain holes. Natural fruit pod (also called a mahogany bean). Pods vary from approximately 3" to 4" in length and 1" to 1-1/2'' in diameter. These fun to chew toy pieces are pre-drilled with a 5/16" hole. Great strung from paper rope or poly rope. Layer with wood slats or wooden balls. Mahogany pod slices come from a natural fruit pod (also called a mahogany bean). The slices are approximately 1/2'' thick and approximately 1'' to 1-1/2'' in diameter. These soft, fun to chew toy pieces are pre-drilled with a 3/16" hole. Great as a base or strung from paper rope or poly rope. Layer with wood slats or wooden balls. Sola chips are made from natural sola wood. Sola is the softest wood available and super for creating toys for the little beaks! Recommended for toys for x-small birds to small birds, or use in food for foraging! Each slice is approximately 1 3//4 long and about 1/16 inch thick with a natural hole that measures approx. 1/8 inch. Because this is a natural item, size may vary slightly. Quantity is 1/2 ounce which yields about 215 pieces. Sola purses are made from natural sola wood bundled up and tied with very small thread. Sola is the softest wood available and super for creating toys for the little beaks! Recommended for toys for x-small birds to small birds, or use in food for foraging! Each purse is approximately 1 1/2" in diameter. Because this is a natural item, size may vary slightly. Quantity is 1/2 ounce which yields about 85 purses. Sola coins are made from natural sola wood. Sola is the softest wood available and super for creating toys for the little beaks! Recommended for toys for x-small birds, or use in food for foraging! Each coin is approximately 3/4" in diameter, 1/8" thick with about a 1/8" hole. Because this is a natural item, size may vary slightly. Quantity is 1/2 ounce which yields about 315 coins. Sola beads are made from natural sola wood. Sola is the softest wood available and super for creating toys for the little beaks! Recommended for toys for x-small birds, or use in food for foraging! Each ball is approximately 1/2" in diameter with about a 1/16" hole. Because this item is natural, size may vary slightly. Quantity is 1/2 ounce which yields about 280 beads. Sola Balls are natural, handmade, and covered with soft sola wood peels. Super for creating an awesome foraging toy or foot toy. Recommended for smaller to medium birds or less aggressive chewing large birds. Approximately 2 3/8" in diameter. Sola Balls are natural, handmade, and covered with soft sola wood cones. Super for creating an awesome foraging toy or foot toy. Recommended for smaller to medium bird. Approximately 2 3/8" in diameter. Sola Balls are natural, handmade, and covered with soft sola wood peels. Super for creating an awesome foraging toy or foot toy. Recommended for smaller to medium birds or less aggressive chewing large birds. Approximately 3" in diameter. Sola Balls are natural, handmade, and covered with soft sola wood spheres. 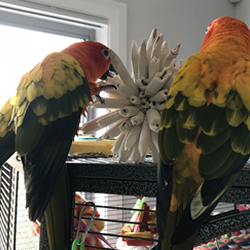 Sola is a very light wood, so these toys are great for even the smallest of beaks. Super for creating an awesome foraging toy. Recommended for smaller to medium birds or less aggressive chewing large birds. Approximately 4 3/4" in diameter. Sola Balls are natural, handmade, and covered with soft sola wood slices. Sola is a very light wood, so these toys are great for even the smallest of beaks. Super for creating an awesome foraging toy. Recommended for smaller to medium birds or less aggressive chewing large birds. Approximately 4 3/4" in diameter. 100% Natural 2 1/2"dried sunflowers. Does NOT contain sunflower seeds. Great for toy making. 100% Natural 2 1/2". Does NOT contain sunflower seeds. Great for toy making. Great little buri palm bag to stuff treats or other toy parts in! Great for those little guys! Approximately 2.5" x 2.5"
Dried corn cobs drilled for toy making or hanging. Edible, fun, shreddable! Be creative. Each piece is approximately 2 inches in length with a 5/16" hole. Don't forget cordage! Nine dried corn cobs drilled for toy making or hanging. Edible, fun, shreddable! Be creative. Each piece is approximately 2 inches in length with a 5/16" hole. Don't forget cordage! Great for overpreeners and pluckers or for that little guy! Great for making toys - awesome toy base! This half Coconut Shell is drilled with twelve holes to tie on lots of fun dangles with bird safe cordage. 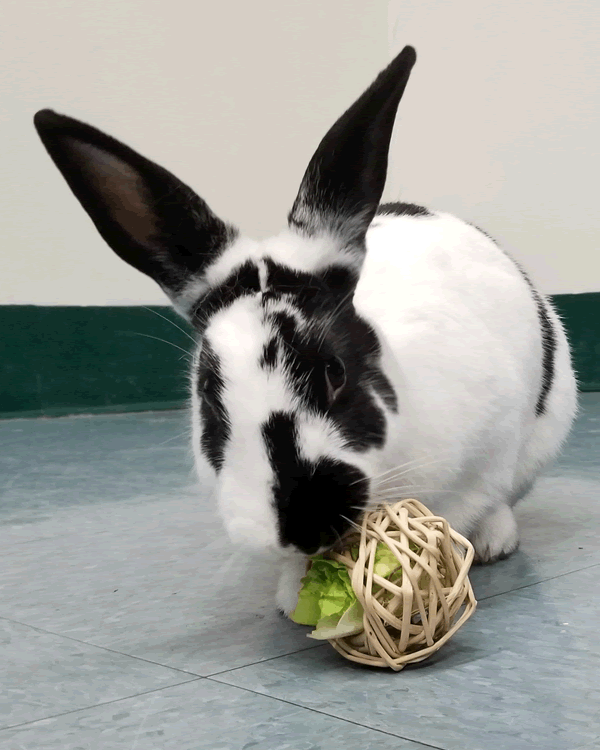 Makes a great foraging toy component. Sizes vary in the range from 3 1/2" to 5" in diameter. Dense fluffy corn husk ring is strung together with jute and topped a wooden hanger. Fun to preen and chew. All Natural, Earth friendly - 100% biodegradable product. Watch your loved one enjoy chewing like never before. The donut-like ring is approximately 6.5" in length x 3" in diameter and 1 1/2" thick. It hangs from a jute cord and wooden hanger. Dense fluffy corn husk ball is strung together with jute and topped a wooden hanger. Fun to preen and chew. All Natural, Earth friendly - 100% biodegradable product. Watch your loved one enjoy chewing like never before. Fluffy corn husk chews are strung together with a wooden hanger on one end and a maize tassel on the other. Fun to preen and chew. All Natural, Earth friendly - 100% biodegradable product. Watch your loved one enjoy chewing like never before. Length varies from approximately 12 to 15"
Diameter ranges from 1.5 to 2"
Cute little woven basket with a handle that birds love to chew. Natural finish. Fill with your parrot's favorite treats. Approximately 2.5" wide and 3 1/2" tall (including handle). A cross-slice of a coconut with the husk. Birds love to shred and chew. 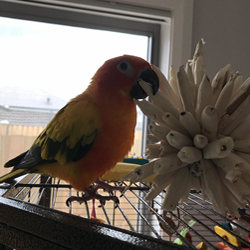 Attach to the side of your cage with coconut rope and watch as your bird shreds this toy part to pieces! Sizes and shapes vary approximately 1" thick and 5" diameter. Coco Rings are slices of natural coconut shells. These will make a fun addition to your toy making materials. Endless possiablitites, great for making fun foot toys too!